KaHo means “Family Treasure” in Japanese. 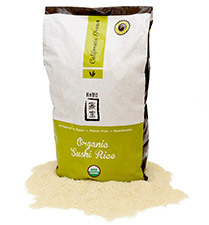 ACC is proud to have partnered with the Rue & Forsman Ranch to bring you the KaHo line of organic rices. Every family has traditions that span generations. At the Rue & Forsman Ranch it is no different. Their families have nurtured a fertile piece of farmland that lies between the Sutter Buttes and Sierra Nevada mountain ranges for more than a half century. There they use pure, snow fed water and natural, sustainable farming practices to preserve the rich, organic quality of KaHo rice. KaHo Organic Sushi Rice is a natural and organic option to ACC’s California Select Premium Japanese Style Short Grain Rice. The firm, short and sticky grains are the preferable consistency for most traditional Japanese dishes, notably sushi. The large, round kernels hold their firmness for long periods of time. The flavor is bold and nutty. This rice is also perfect for creamy rice dishes such as risotto and rice pudding.